Interesting Facts Butterprint, along with Gooseberry, was the first pattern printed on the new Cinderella Nesting Bowls. Butterprint was one of the first printed patterns on the opal ware Pyrex line, preceded only by Snowflake and Pink Daisy. Released in 1957 Butterprint was the result of growing market trends with its turquoise on white and white on turquoise Amish print. 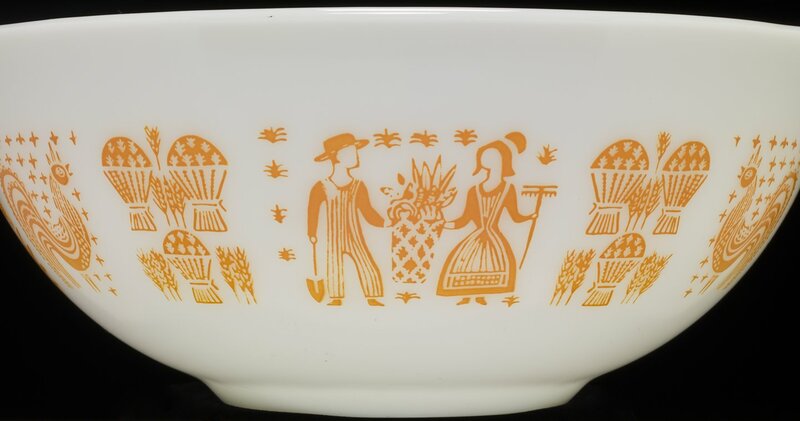 Along with Gooseberry, Butterprint was one of the first patterns debuted on the new “Cinderella Bowls.” Cinderella Bowls were a series of large nested mixing bowls with a handle or spout on each side, and designed by John Philip Johnson. The name Cinderella was applied to quite a few different Pyrex products from carafes to butter dishes even though the new spout and handle nesting bowls marked the first use of this name. Promotional sets with orange and pink Butterprint on a white background and white Butterprint on a pink background were released in the late 1950s and early 1960s due to the design’s popularity. The success of this design later yielded a Bake, Serve and Store set (470) and Oven Refrigerator and Freezer set (500) in 1959 and the 480 Casserole set in 1960. Butterprint was discontinued in 1968.